Hereford and Herefordians never seem to stop surprising me. Being an out of town girl I fell in love with Hereford when I met Mr Jones, and over the last seven years I have become more and more enthralled with what Hereford has to offer each month. With a young family and some lively spaniels Hereford could not offer more. Mr Jones and I live in a lovely little village just outside the city and with amazing links into the city, our village offers everything we could want. There is a brilliant village hall with playing grounds, two great schools (primary and secondary) as well as our lovely little church. Willow was christened at St. James Lugwardine nearly two years ago now, but ever since moving to the village Mum and I have cleaned the church every August. This August Dad and Mr Jones joined us too as my ‘bump’ makes it harder for me to climb around getting into the nooks and crannies. 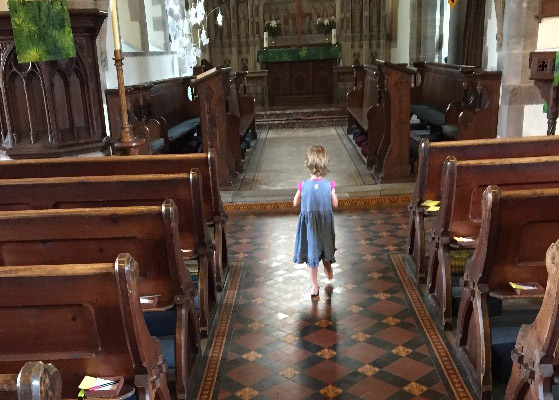 Willow helps too and loves running up and down the Aisle (she does this during family service as well… ooops). As a family we also take great advantage of all the great walks there are around the country and also down by the river. Our weekend early morning walks tend to focus around a trip to the Bishop meadows where the dogs can splash about (when the river is low) and Willow can watch as her silly puppy chases the house martins that swoop over the playing fields. The walk is normally topped off with a trip to the children’s play park where Willow can run and play as much as she likes. The spaniels keep a close eye on her and can be seen with their noses pressed through the bars making sure their little girl is doing ok without them. Who could not love spaniels??? On our walk over the river we found a Troll door, (not one of those horrid internet harassers) but a real life troll door. Willow loves her fairy door at home and she now loves to run and look at the door waiting for him to appear. As many of you will remember Trolls are the creatures that guard the river bridges in many fairy stories and to find one in Hereford has been so exciting. 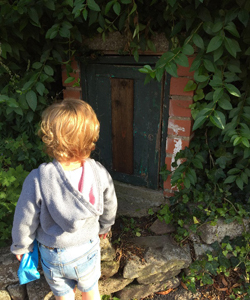 Has anyone else found fairy or troll doors around our county? We have also had a few charity events this month for different local charities. Our first event was for the Little Princess Trust where we went to an open air film and family fun afternoon at a friend’s farm. This event was fantastic and for a little girl who is obsessed with a) tractors b) bouncing and c) copters (helicopters), it could not offer more. Willow managed to go on a bouncy castle all on her own which for such a shy little girl was a massive achievement, although getting her off was an altogether different task once she had discovered her bounce. She also saw a “copter” take off, her obsession with them started from her visit to Shobdon airfield last month. She also made her Daddy dance with her and all the other little ones during a Starlight Company’s dance routines. It was a good thing I was sitting down as it was an adorable but hilarious sight. Our second event was to Humprey’s and Symmonds Solicitors Tea Party for St. Michael’s Hospice. I don’t think there is anyone who doesn’t understand and appreciate the amazing work the guys and girls do at the hospice for the local area, it is something which we as a family and a business greatly support. So we were only too delighted to be invited and attend a fantastic afternoon in their gardens, enjoying a brilliant jazz band, eating fantastically yummy cakes and chatting among friends, with local colleagues contributing to a very worthy cause. We also have had a few family parties this month, one to celebrate was my Auntie’s 60th (happy birthday Auntie Anne-Marie) and one to see the rest of the Jones family before the start of school. Willow was able to catch up with her Auntie Emma and Uncle Tom over the summer break as well. As her speech is really coming along she was able to boss the pair around and wrap them around her little finger. August is the start of my favourite season in Hereford, the harvest. Tractors are trundling up and down the sleeping lanes and roads. Guessing their loads is always fun. Nothing beats the smell of freshly harvested hay, seeing it lay upon the road sides as the tractors squeeze up through narrow lanes. It is also Willow’s favourite time of year. She gets to raid Granny’s veggie garden and our fruit patch. Giving Willow a tub to go and pick raspberries, blackberries, greengages and plums (to name but a few delights) is always a risky business. Willow loves fruit and the amount she picks is definitely not represented by the amount in her tubs at the end of the exercise. It is more like three for Willow, one maybe for the tub, but then again no, best they go in her mouth for safe keeping. It’s a good thing that there appears to be lots to pick over the coming weeks. I must try and stop her more but it is just so cute. 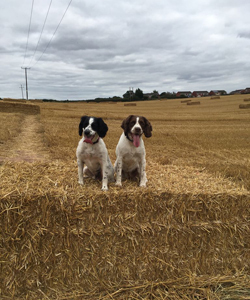 The spaniel’s Mae and Drake are also loving harvest season and are enjoying nothing more than scampering around a freshly harvested field; freely jumping over and onto bails of straw. 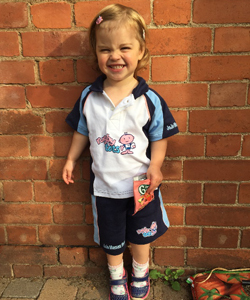 Willow started Rugby Tots in September and she absolutely loves running around and chasing the ball. 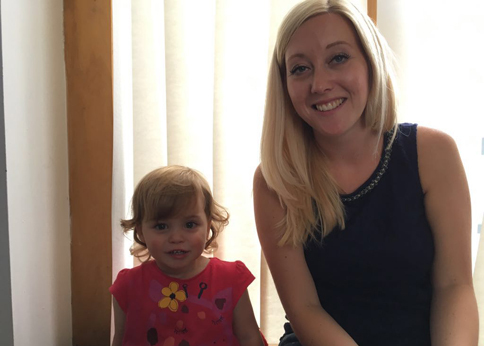 Rugby Tots is open to girls and boys from 2-years-old and provides a great outlet for all that excess energy and enthusiasm whilst getting fit and socialising. Willow’s Daddy was a big rugby player as well as an excellent horseman (he will deny it if asked though) and so it is wonderful to see her following in his footsteps. Talking about Mr Jones, we spent a rather wonderful Bank Holiday Monday with the rest of the Jones family at the farm where the cousins played games and ran around until they were all tired out. Luckily the sun was out and the countryside looked magnificent. 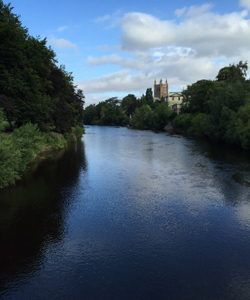 We often take for granted the place where we live or grew up, but Hereford really is beautiful this time of year and I count ourselves lucky to live in such a beautiful and diverse place, it is full of things to do. 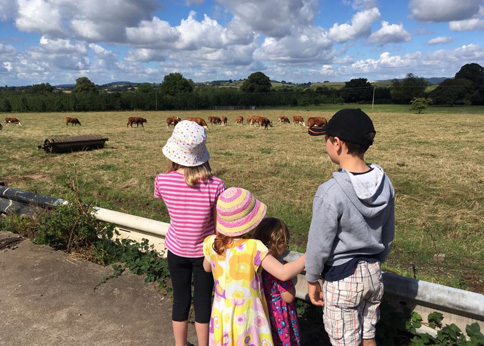 Countryside, Day Trips, Family Farm, Family Fun, Harvest Season, hereford, Herefordshire, Humprey's and Symonds, Little Princess Trust, Lugwardine, River Wye, Rugby, Rugby Tots, Shobdon, St James Church, St Michael's Hospice, Starlight Company, Tea Party, Wonderful Weekends. Bookmark.